The plantar response is an important test to identify an upper motor neuron lesion. To elicit it, the muscles of the lower limbs must be relaxed. The outer edge of the sole of the foot is stimulated by firmly scratching a blunt object like a key or a stick along it from the heel towards the little toe. This is what Joseph Babinski did in the year 1896. He described the 'great toe sign' that year and then in 1903 the 'toe abduction or fan sign'. Nowadays, a final medial movement across the sole of the metatarsus is also done. i.e. we start at the heel to the little toe and finally arcing to the big toe. 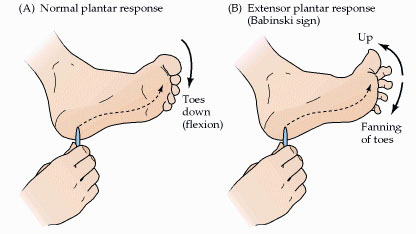 The final arcing movement is absent in the original Babinski plantar response test. Babinski sign refers to a combination of 'the great toe sign' and the 'fan sign'. The normal response is plantar flexion of the toes (down going) and they are drawn together. More precisely, there is flexion of the big toe and adduction of the other toes. The abnormal response is called as Babinski's sign positive. In this case, there is dorsiflexion/extension (up going) of the toes especially the big toe and fanning (spreading apart) of the other toes during and immediately after stroking the lateral plantar surface of the foot. At times, the toes are silent i.e they are neither moving up or down. That is why the plantar response should always be checked in both limbs. If the toes are downgoing in one limb and they are silent on the other one, then the silent one is considered abnormal. Positive Babinski's sign is always pathological in adults but it may be normal in children less than 1 year whereby myelination of the corticospinal tract has not yet been completed. 4) Austregesilo and Esposel’s sign - stimulation of the thigh. All these signs are only variations of Babinski’s sign and give a clear indication of pyramidal syndrome. 1) The stimulus must be firm but not painful. Terrific put up, attended on top not to mention saved your web sites. I just can’t hang around to study further because of most people.